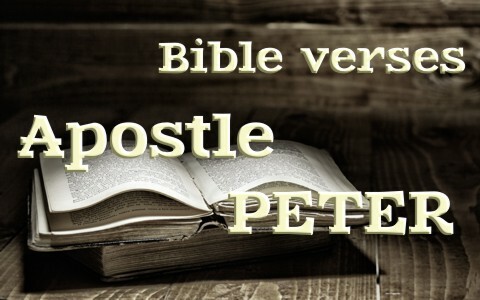 Here are eight important Bible verses that mention the Apostle Peter. We might like to think that we came to Jesus but the truth is, we are called by God (Eph 1) as Jesus told the disciples, “You did not choose me, but I chose you and appointed you that you should go and bear fruit and that your fruit should abide, so that whatever you ask the Father in my name, he may give it to you” (John 15:16) so “Did I not choose you, the Twelve” (John 6:70)? Jesus was the One Who called Peter and his brother, Andrew, and told them, “Follow Me” which shows that “No one can come to me unless the Father who sent me draws him. And I will raise him up on the last day” (John 6:44). This is where the Apostle Peter actually defies the law of gravity because Jesus commanded him “Come” and he does! You wonder what the other disciples must have thought; “Wow, Peter’s actually walking on water” but “when he saw the wind, he was afraid, and beginning to sink he cried out, “Lord, save me.” Jesus immediately reached out his hand and took hold of him, saying to him, “O you of little faith, why did you doubt?” And when they got into the boat, the wind ceased” (Matt 14:30-32). Peter only began to sink when he took his eyes off of Jesus and fixed them onto the wind and the water. That’s when Jesus had to supernaturally save Peter by reaching out His hand and taking hold of Him. Doesn’t Jesus have to do the same to us at times and for the very same reason; we our eyes off of Jesus? When the wind ceased, “those in the boat worshiped him, saying, ‘Truly you are the Son of God’” (Matt 14:33) so let us also worship Him. When Jesus had set Himself to go up to Jerusalem, knowing that He was going to die and suffer so that we might be saved, Peter actually rebuked Him. Imagine that! Peter, Jesus’ disciple, rebukes Jesus by taking Him aside and commanding Him, “This shall never happen to you.” Peter didn’t get it and was acting in the flesh. If Peter knew then what He knew later, he would have understood that Jesus had to go to the cross to redeem us from the wrath of God so that we might enter the kingdom by having the righteousness of Christ imputed on our behalf (2 Cor 5:21). Peter was never the shy one. He was often the one to speak up and impulsive by nature and after the experience of seeing Jesus’ Shekinah glory as He revealed Himself to Peter, James, and John, all Peter could think to say was “Lord, it is good that we are here. If you wish, I will make three tents here, one for you and one for Moses and one for Elijah.” Perhaps Peter was wanting the kingdom to start right then and there but he would find out later that Jesus had to give His life as a ransom for many (Matt 20:28). For the Jews, they would allow only three sins against them before they would cease to forgive a person anymore, so it is possibly with this knowledge that Peter comes to Jesus and piously says, “Lord, how often will my brother sin against me, and I forgive him? As many as seven times?” Peter may have thought that I’ll go more than twice that of the Jews in forgiving someone but Jesus “Wrong, Peter,” because “I do not say to you seven times, but seventy-seven times” (Matt 18:22) and that’s not really a limit. The “seventy-seven times” is symbolic of our continuous forgiveness of others. There is no ceiling. Once again we hear Peter being the first to speak up and respond to Jesus’ earlier statement that “you will all fall away because of me this night. For it is written, ‘I will strike the shepherd, and the sheep of the flock will be scattered’” (Matt 26:31). When Peter hears Jesus say this, he says “Even if I must die with you, I will not deny you!” And all the disciples said the same” so the other disciples agreed too but Jesus says specifically to Peter, “Truly, I tell you, this very night, before the rooster crows, you will deny me three times” (Matt 26:34) and of course that prophecy of Jesus’ comes true that very night (Matt 26:69-75). When Peter had denied Jesus, not once or twice, but three times, Peter repented and was broken over his sin of betrayal. He was like the rest who fled but at least we notice Peter stayed someone close to Jesus during the night of His betrayal. There is no mention of any of the other disciples except John who was with Jesus’ mother, Mary. Thankfully, God is a forgiving God and Jesus restored (or forgave) Peter and used him in a mighty way in the church (Acts 2). This may have been the greatest sermon ever given by Peter and perhaps in the early church. Paul would be the only other exception I could think of, but on the Day of Pentecost, Peter stood up and boldly declared the Jews guilty of murdering the Messiah and “when they heard this they were cut to the heart, and said to Peter and the rest of the apostles, “Brothers, what shall we do?” And Peter said to them, “Repent and be baptized every one of you in the name of Jesus Christ for the forgiveness of your sins, and you will receive the gift of the Holy Spirit. For the promise is for you and for your children and for all who are far off, everyone whom the Lord our God calls to himself” (Acts 2:37-39). The result was “those who received his word were baptized, and there were added that day about three thousand souls” (Acts 2:41). The account of the Apostle Peter’s life give us all hope; hope that we can be forgiven for lapses of faith in Christ; hope that even when our will is contrary to that of God, He will bring us back to His will; hope for those of us who have denied Him at times by our silence before others; and just like Jesus restored Peter to fellowship by forgiving him, we must be forgiving of others to continue in our fellowship with the Body of Christ, the Church. We have been forgiven so much (Rom 5:8-10) so remember, there is nothing that He won’t forgive in your life. He forgives us of all our sins (1 John 1:9) once we repent and trust in His Son, Jesus Christ. Previous post: What Are Some Other Names for Jesus in the Bible? Next post: Does Satan Know His Fate?